Biocompatible ceramic bone graft substitute “APACERAM” was created by our own unique technology. 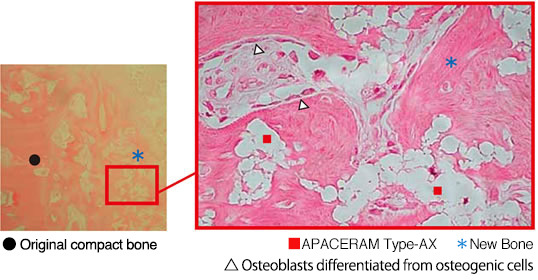 APACERAM consists of synthetic hydroxyapatite 〔Ca10(PO4)6(OH)2〕that is an inorganic component of human bone. It has excellent biocompatibility and biological safety. APACERAM has macro pores and micro pores in the structure. 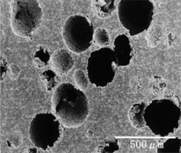 Macro pores are effective for new bone formation, while micro pores provide interconnectivity of the pores. Wide varieties of the models are available with various mechanical strength and porosity depending on the application sites and intended use. Undecalcified sample of APACERAM that has been placed in the femur of adult canine (3 months after implantation). New bone was observed intruding into pores of APACERAM. 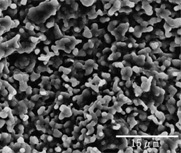 High density sintered body consisting of closely packed particles of 0.3～0.5μm. A variety of porosity and shapes are available depending on the intended use and implantation site, including versatile blocks, granules and various spacers. 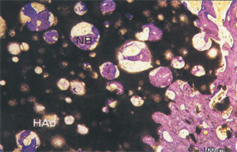 Type-AX is a hydroxyapatite bone graft substitute of ultra-high porosity of “Triple pore structure”. APACERAM Type-AX implanted in the defect Ø4mm × 6mmL in the iliac of the beagle (radiography). In 26th weeks after implantation, boundaries around the material became vague showing progress of new bone formation. tissue in terms of structures and functions. Interconnecting pore structure and porous inner wall structure of the pores enable early bone formation. a) APACERAM Type-AX implanted in the defect Ø4mm × 6mmL in the iliac of the beagle (Toluidine blue staining). In 4 weeks after implantation, new bone formation was observed all over the implanted site with active new bone in the pores. In 4 weeks after implantation, new bone formation was observed in the pores and osteoblasts were found on the surface of the newly formed bone.